The weather was gloomy, work has been hectic, there’s not much new to report and time is tight … so here are some random cards. 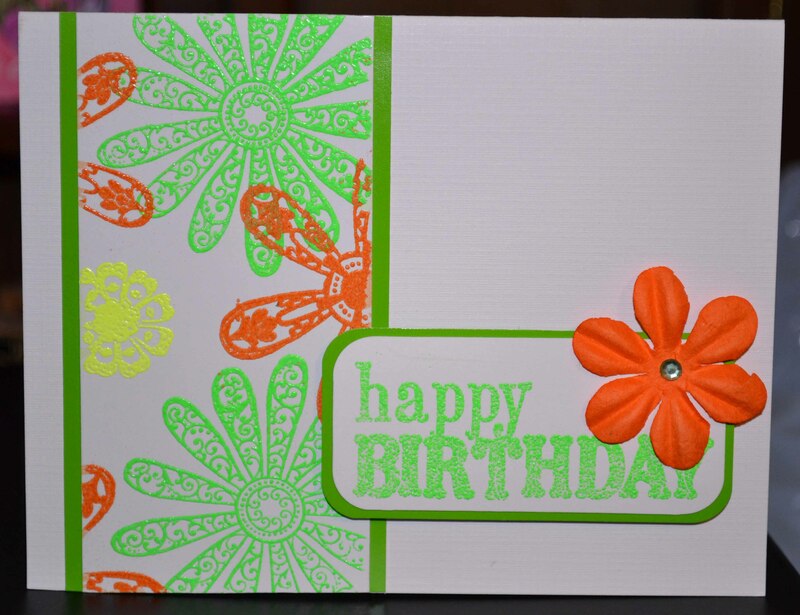 First, since I talked about some of my favorite embossing powders last week, here is a cheery card made using Zing! 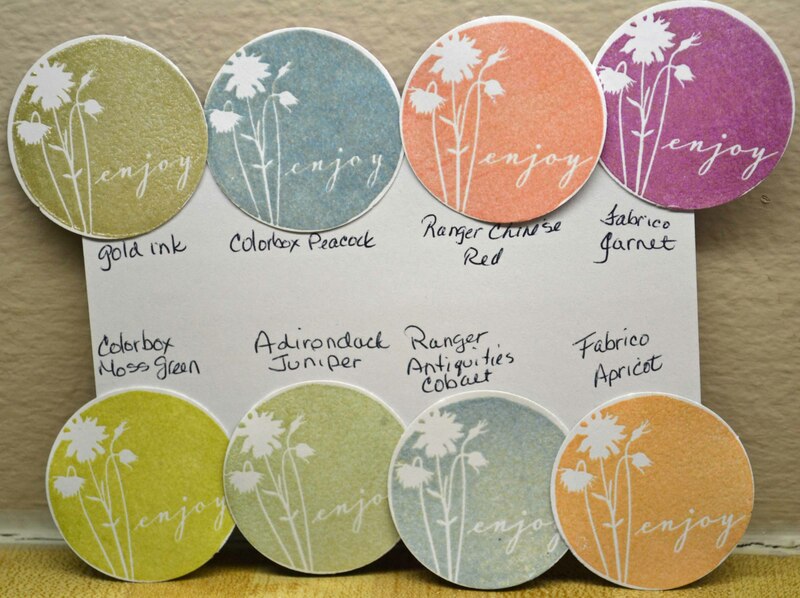 powders from American Crafts. Zowie, those colors are bright! 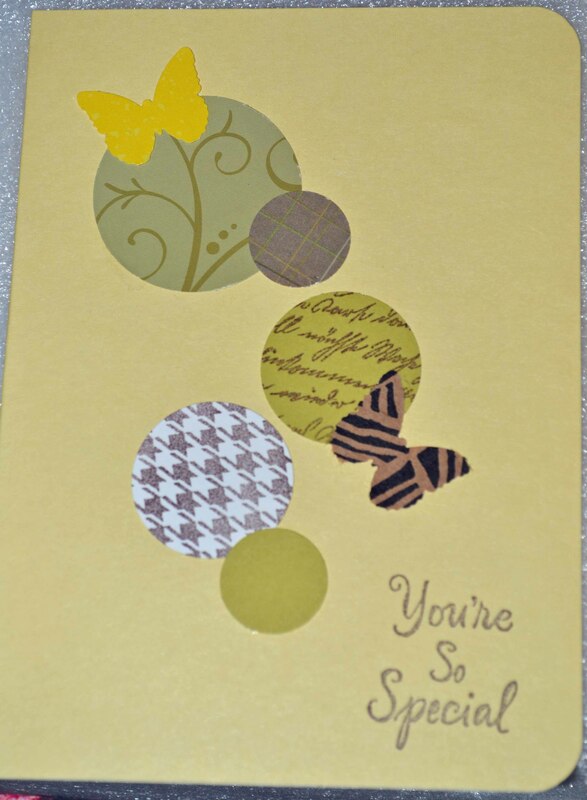 And more mellow yellow made from … yes, scraps! I know, not terribly exciting, but fast and easy. Thanks for indulging me! Sometimes, things just come together. 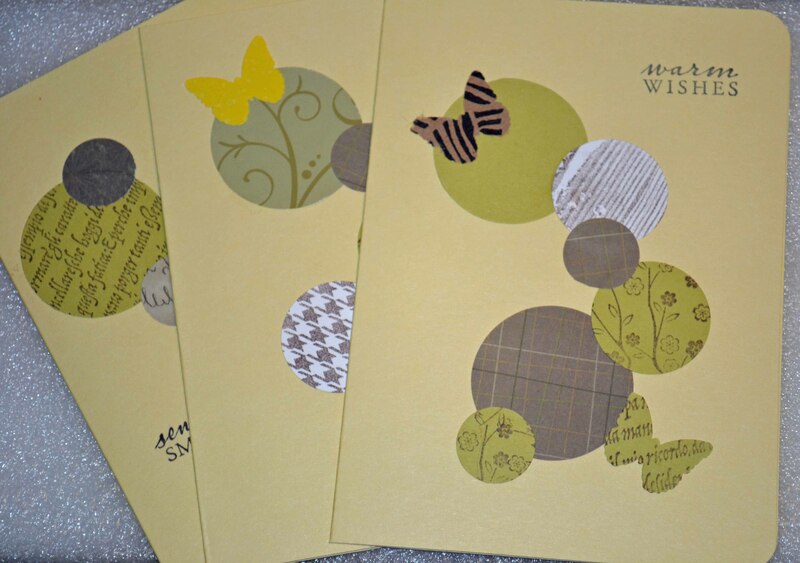 Last week I used my new M-Bossabilities™ embossing folders and Distress Inks to create fast, simple cards. 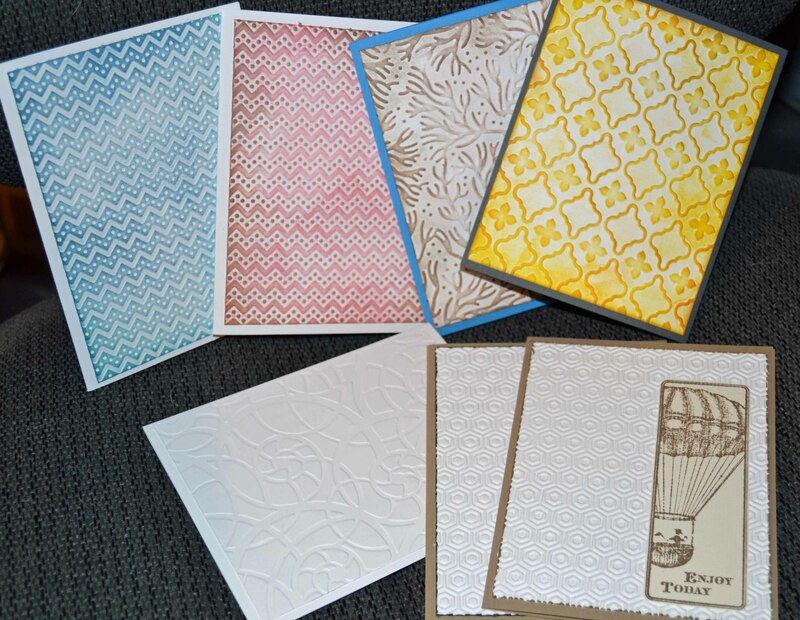 I wanted simple stamped images for these cards so the texture of the dry embossing would shine through. 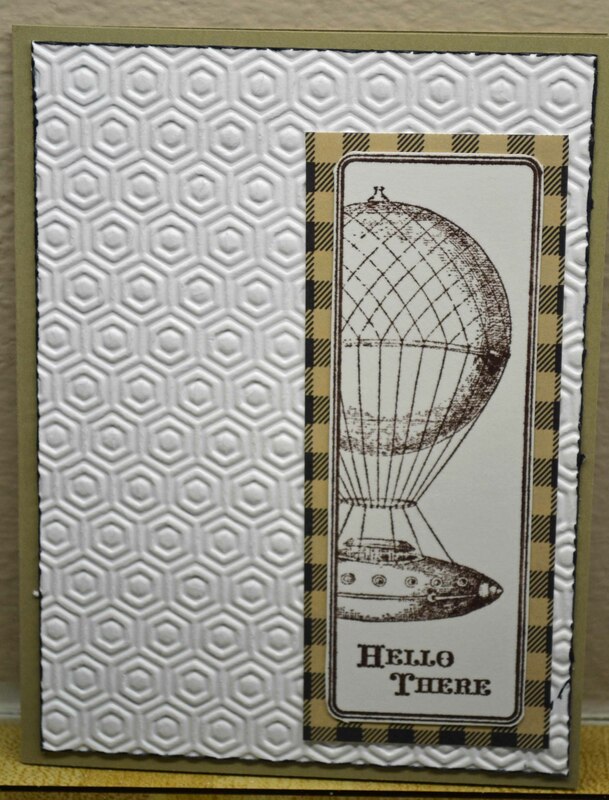 I had just received the solid sentiment images from Hero Arts and re-discovered some cool embossing powders. So what’s a girl to do? Why, play of course! 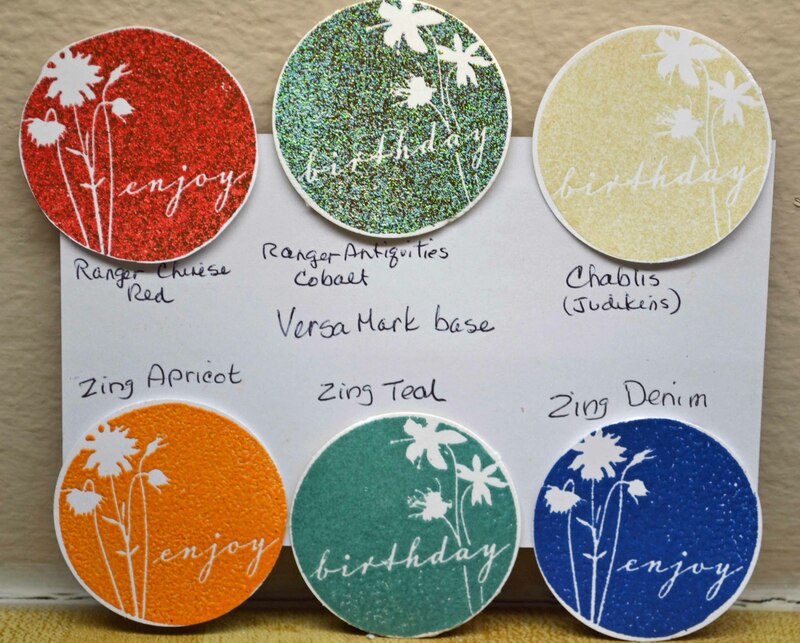 What’s your favorite go-embossing powder? 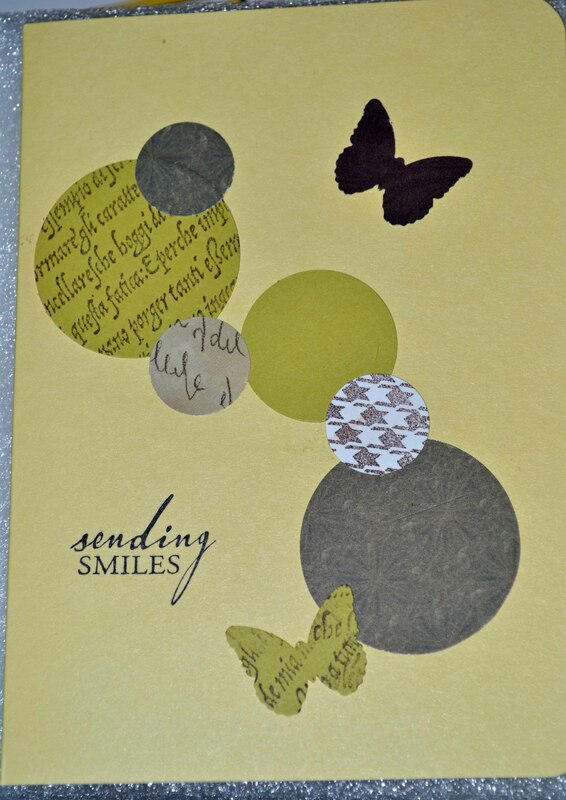 The one above uses Regal EL002, colored with Distress Mustard Seed, Wild Honey and edged with Old Paper. 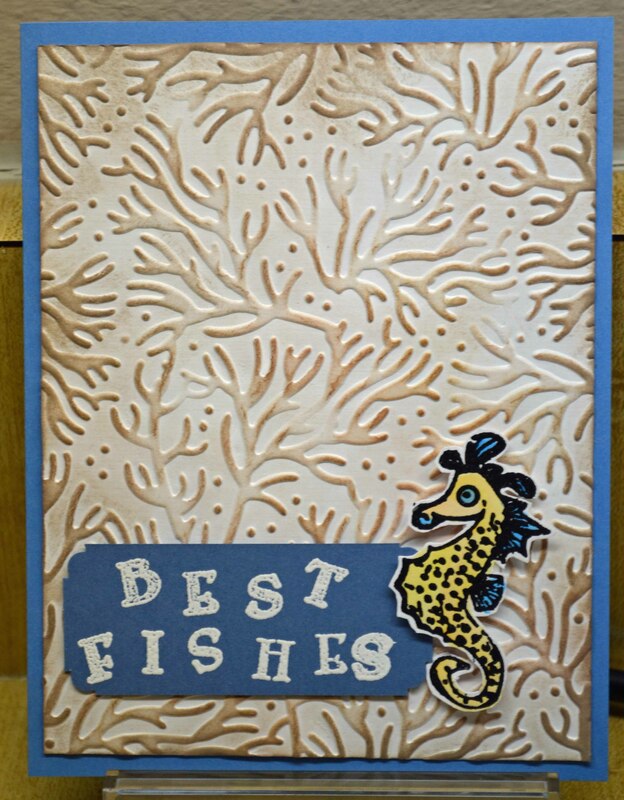 M-Bossabilities™ folder Sea Beauty ES-007; inked with Distress Pumicd Stone; stamps from Inkadinkado. 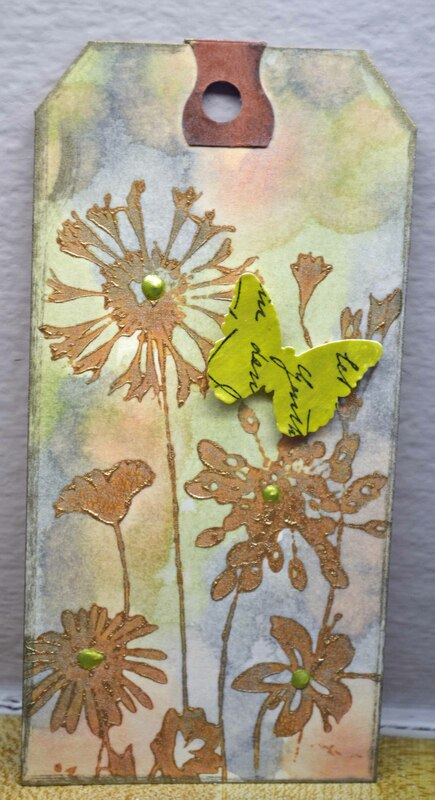 I recently took an online class, called Creative Chemistry 101, from the amazing Tim Holtz. 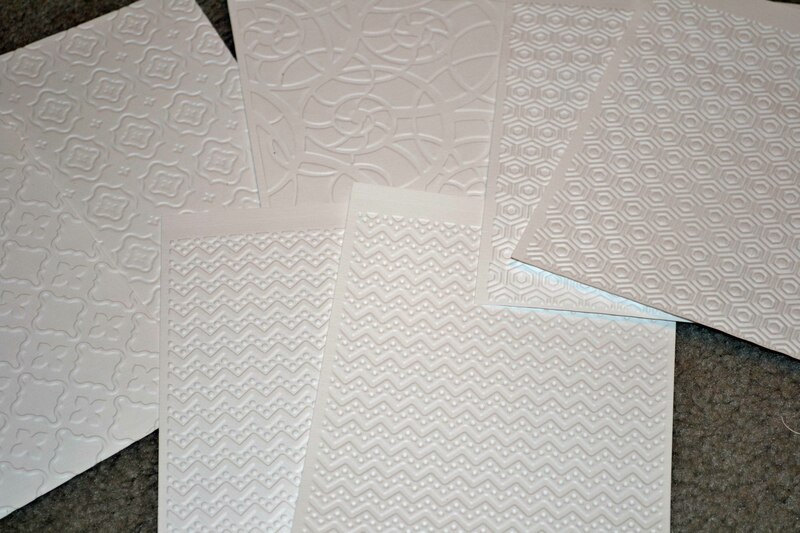 Tim shared oodles of tips and techniques for working with Ranger products. I have been sadly behind in the fun part — actually MAKING things! 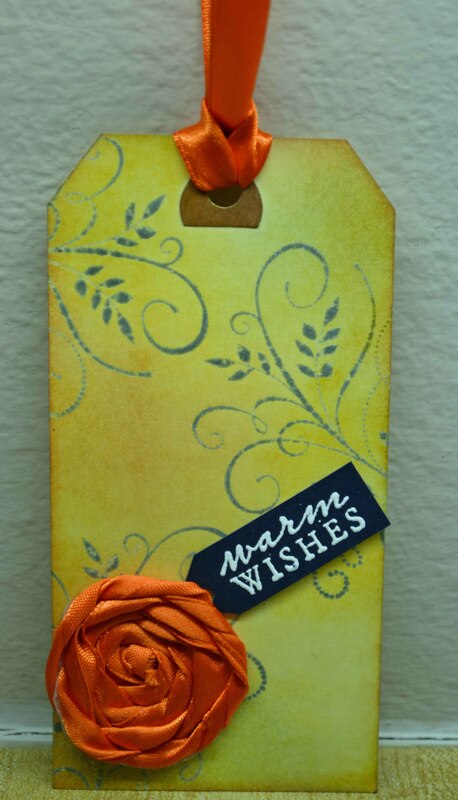 But I managed to play a little and created a few tags. 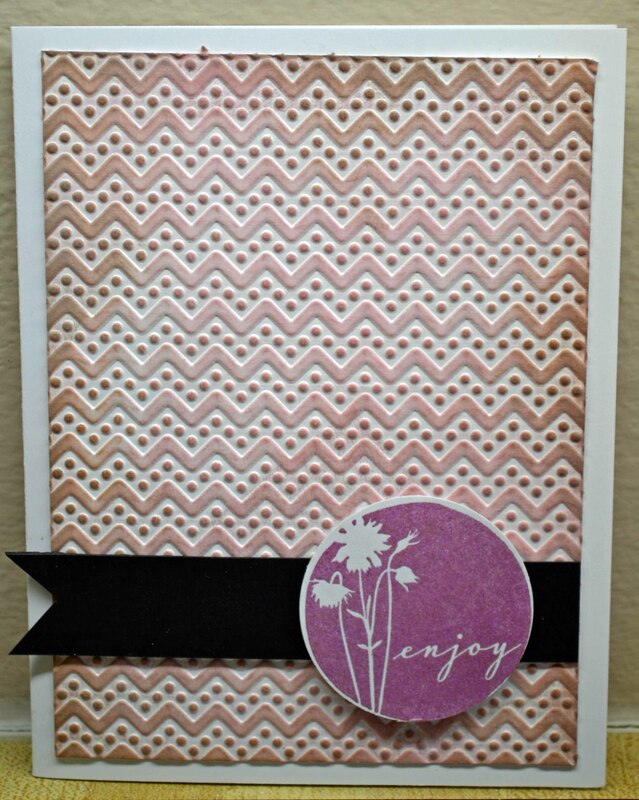 In this first tag, I learned that yes, you CAN emboss with Distress inks! 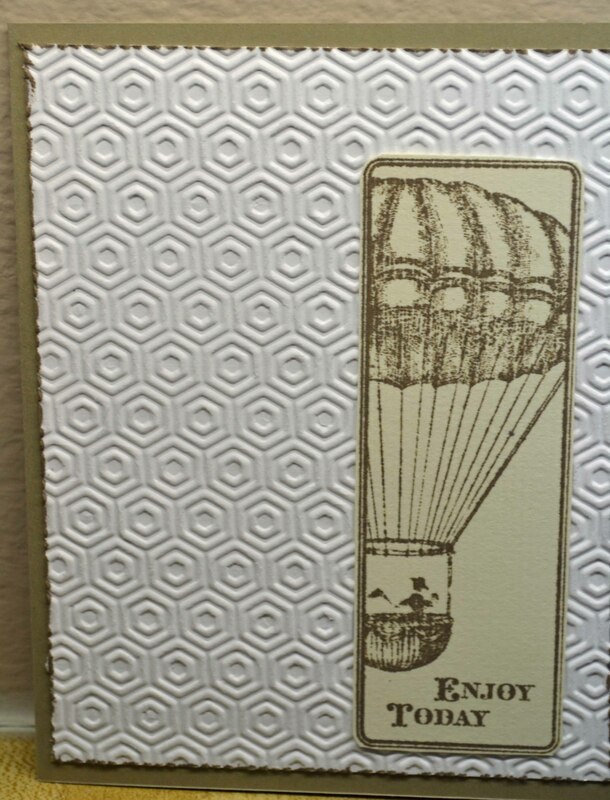 The flourish vine (Hero Arts) was stamped with Distress Ink, embossed with clear powder. 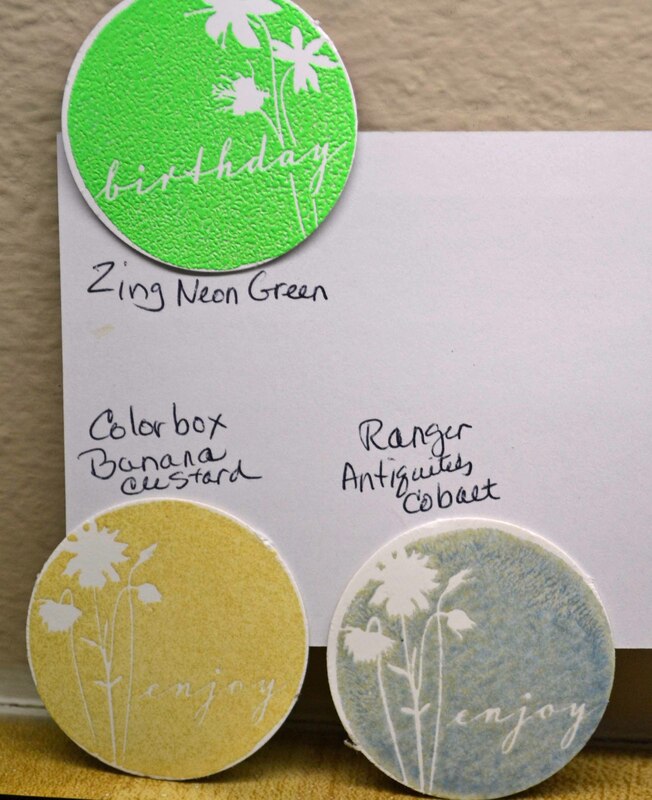 Various distress inks where then blended onto the tag. 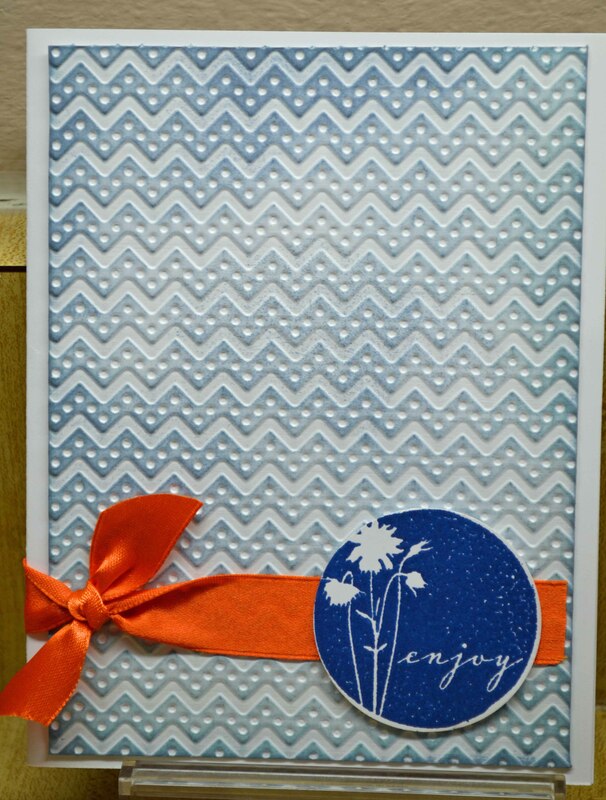 The ribbon rosette was made using Paper Source ribbon and a large glue dot from Therm O Web. 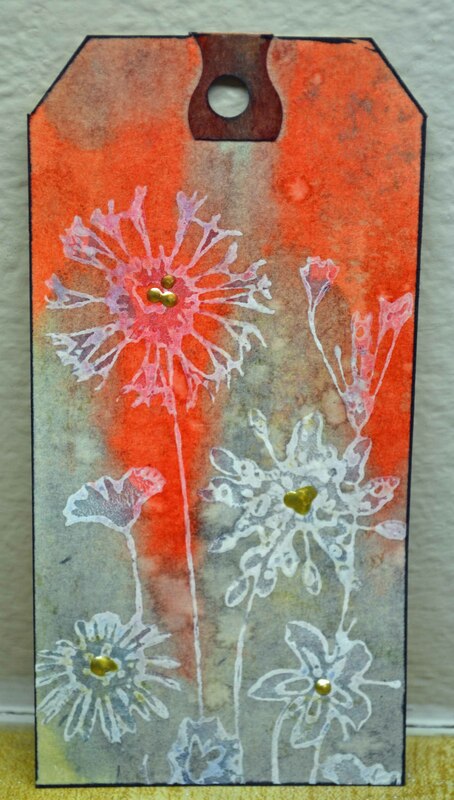 These next tags were made by inking my image (Hero Arts) using Ranger Acrylic Paint Dabbers, creating a resist, then tinting with Distress Stains. 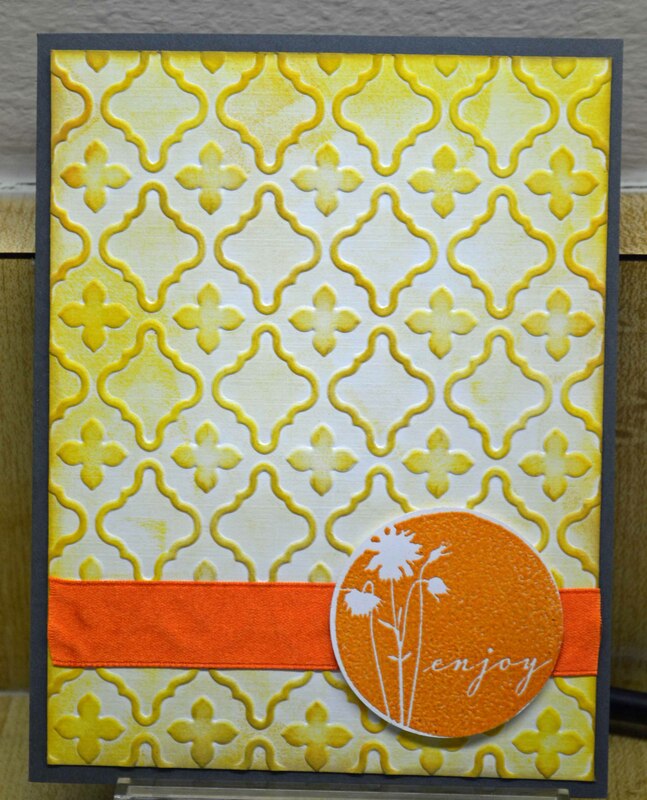 I really liked the texture of the gold, which came out rather thick. 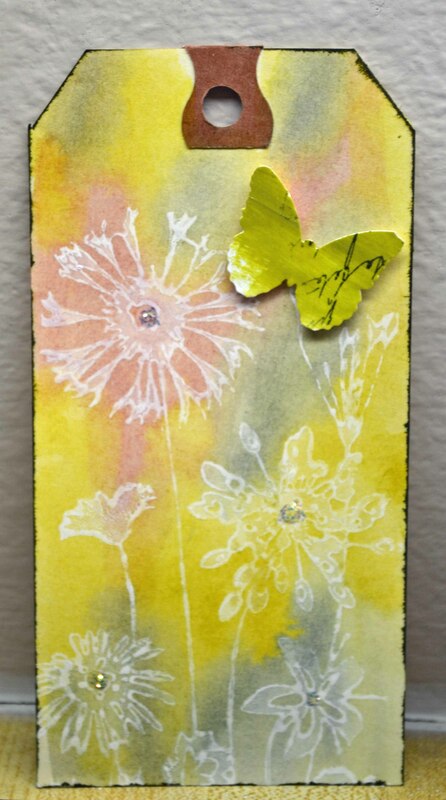 To create the butterfly, I spread Ranger Dimensional Pearls (Lettuce) on a piece of scrap card stock and let it dry. 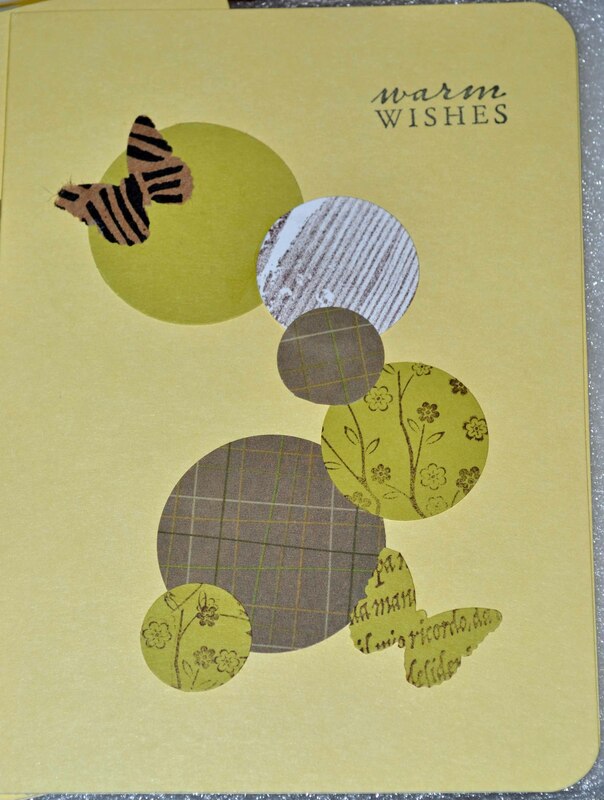 I stamped over it, then punched my butterfly (Martha Stewart).